purpose as a house of worship was the main focus for those who commissioned him. 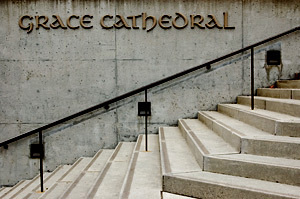 The reality of Grace Cathedral today is that it is seen in many different ways by those who go there for varied reasons. For some it is a place to meditate as they walk the labyrinth. For others it is a place to walk a dog. For the children at the parish school it is a place to learn and play. For many it is a place to exercise. For me Grace Cathedral, particularly the courtyard, has been an oasis of quiet calm in an otherwise hectic city. As I have mounted its steps and meandered through its open spaces, I have come to overlook the grandeur that is so obvious to find overwhelming simplicity. As I approached this project it immediately struck me how much concrete I was surrounded by, and I have been amazed at how something so common and ordinary could be fashioned into something so extraordinary.